Location: Buried in comic book pages and trying to  make the stack higher! Way ahead of you there honey. How do you think Zarkcus go involved? Anyway I'm gonna play town crier at the Anime conventions coming up. There's enough gamers there who might be interested if the number of Final Fantasy cosplayers is any indication. That reminds me, I could send the link to Crack Santa and Ed! Ohohohohohoho! Yeah, annoyingly this site is dying. 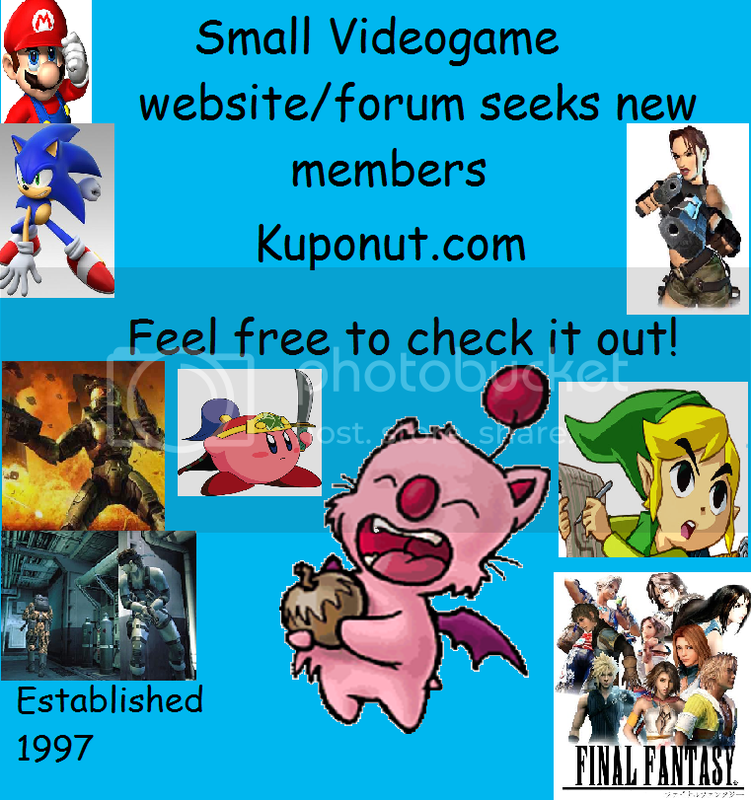 It has changed from the kuponut I joined about 4 years ago, I remember such people as Ansem, ChibiSephy (spelling? ), Seanbaby (Despite the fact I was in got into an argument with him)and many others. And, I'm curious... Who actually thinks the Spirit of Aeris has turned himself into a walking billboard? I haven't yet, but when I have the cash I will. I have to pay off my Uncle for my PSP first and then I'll be ordering the T-shirt. About a month. 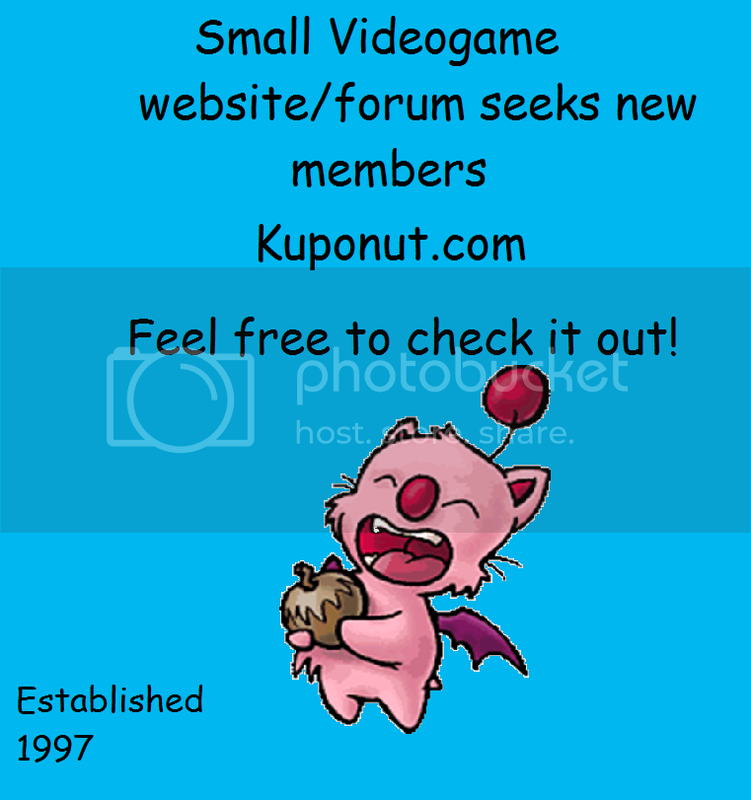 I'm thinking of adding something like A small forum looking for new members below the picture with the URL above the picture. I'm trying to convey that we are a small forum with a core group of regulars who really need more members as in the 3-4 years most of us have been here, we have pretty much run out of things to talk about. Now, how do I word it so its short, sweet and eye catching? Suggestions more than welcome. Ive come up with something! If this doesn't grab attention then nothing will! Hmm, a bit too noticable. Why don't you just paint the URL on your torso and back and run onto a football match naked? Cloud, its supposed to draw attention. Thats the whole point. And yeah it should raise a few heads. I can't wait to start walking around with it on! A little to bright for my tastes, but if thats what rocks your socks, go for it. Well, it has to catch attention, so I figured that bright colors would work best. I don't think much people would notice if it was dark and gloomy looking. Anyway, I had another idea for the design. I haven't decided which to go for yet. And if you think you can do better then open up Paint/photoshop and a web browser. I haven't decided yet so I could just as easily be wearing your design. Sign into msn so I can send it to you! 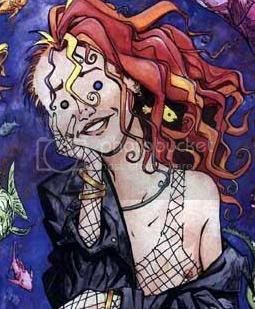 So, how many of you crazy peoples remember me? Egads! tis Sephiroth! Welcome back Comrade!